The Office of Public Health (OPH) Childhood Lead Poisoning Program provides information, education and prevention strategies to assist parents in identifying and controlling a child’s exposure to lead, before it occurs. Case management services are also available for children with elevated lead levels. In addition to education, case management services include a home assessment and environmental services (dependent on the child’s lead level). A public health nurse and environmental health specialist assist parents with strategies to help reduce the child’s lead level, and keep the lead level from increasing. Physicians are encouraged to report any lead levels of >5 micrograms per deciliter (ug/dL) to OPH for case management services. Children under the age of 7 years old are at risk for lead poisoning because they are growing so rapidly and their major organs are still developing. Young children get lead poisoned by putting their hands or objects into their mouths that contain lead or contaminated with lead dust. Pregnant woman, and children adopted from other countries are also at risk for lead poisoning. All houses built before 1978 are likely to contain some lead-based paint. However, it is the chipping and pealing of the paint that causes a problem. Lead-based paint and lead contaminated dust are the most hazardous sources of lead poisoning for U.S. children. Other source of lead exposure include imported folk medicines, food, cookware, toys and cosmetics. Parents, whose jobs or hobbies involve working with lead-based products such as construction work, stained glass, battery plants, making bullets or using a firing range, can also be a source of lead poisoning for a child. What are the recommendations for CHILDHOOD LEAD TESTING? Children should be screened according to the recommended guidelines for Medicaid, at ages 12 and 24 months, and between 36 to 72 months of age in those without prior screening. 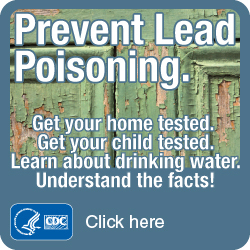 Talk to your child’s primary care provider about testing your child for lead poisoning. Children can be given a blood test to measure the level of lead in their blood. Medicaid and most private health insurance cover the cost of these blood tests.